Huppy Dodd is missing from the photo but Cousin Calpurnia is present by the refrigerator. Mama Dodd-Wiggily's hyphenated name derived from her preference for short relationships. There had certainly been previous ones, but we were only aware of the two. Subsequent surgery prevented her name from becoming too long and unwieldy. Mama Dodd started out nameless. We first met her "sharing" our three cats' food on the tiny back porch. She was clearly homeless: hungry, unkempt and unapproachable. As we put out a little more food, she became a regular. She was an attractive cat; a long-haired calico with the stocky build of a Persian and just a hint of the flat face. She was not aggressive or hostile, but extremely wary and not to be touched. When we moved to a larger apartment immediately across the street, she followed for meals but seemed to keep her original secret home base. 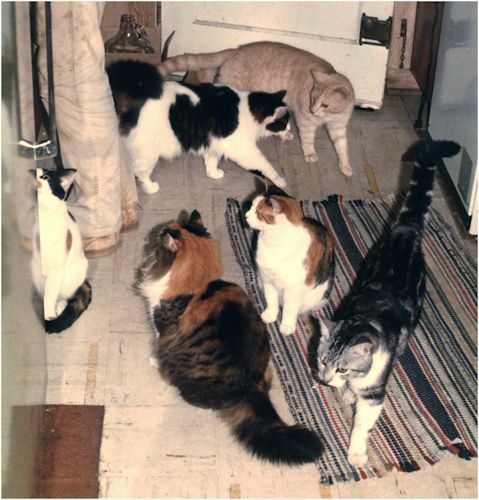 As winter approached we fed our cats inside, but Mama Dodd would not come in. We met the Dodds at midnight on Christmas Eve. This was when Mama Dodd got her first name, the surname came later. We heard strange meows, and investigated to find Mama Dodd had brought two kittens to meet us. They were well past six weeks old, and much in need of solid food. For several weeks the Dodds were fed close to their hidden home, to save them the trip across the busy street. Mama Dodd expected us to take care of them, and we obliged. After some time and coaxing, I was able to pet the male kitten (whom we named Huppy Dodd after a favorite New Yorker cartoon). The female kitten, Rabbit Dodd, was more wary. I was not able to touch her until she appeared to experience a short seizure. Treatment for tape worm, along with vitamins, seemed to eliminate that problem. The young Dodds moved in. The Dodds' father appeared to be a disreputable neighborhood cat named Switchblade. Switchblade was distinctive for his deformed abbreviated tail, and his resemblance to a skinny cow. He was white with black splotches and cow-like hindquarters. The young Dodds' both inherited his tail deformity, and his short hair. Only Huppy inherited the hips; this was ameliorated by his small size and more attractive color markings. Huppy Dodd's tail was permanently cocked at a jaunty angle, and only about six inches long. Huppy's name came from his dog-like affection and nature; Rabbit's name was derived solely from her appearance, although she could run! Rabbit Dodd was a sweet white-faced calico with a stubby, furry tail and long white back legs. Both cats' growth was probably stunted by their early deprivation; they remained the size of six month kittens all their lives. We were down to only three cats in the house at this time, a previous cat with the full name of "Small Bear with No Brain" having proved true to it, most unfortunately. The two Dodds fit right in, and Mama Dodd grew so bold as to step inside to eat (although with the door wide-open and only inches away). She was already showing evidence of another liaison. One of our cats was an old soul and superior being by the name of Wheatgerm (or more often "Sweetgerm"). He took quite a paternal interest in the youngsters, and helped them descend from their early tree climbing adventures; he would calmly follow them to show them the route down when they ventured too high. We met the Wiggilys much earlier in their lives. Mama Dodd moved this litter under our front porch when they were only a few weeks old. With spring now here, we got aquainted with them by feeding them in the front flower bed. There were four Wiggilys originally. Two we did not name, but homes were found for them. The other two seemed to come with their own names, and these two moved inside with us. Mama Dodd-Wiggily was encouraged to join them. It took quite some time before she became comfortable inside the house without a clear escape route, but eventually she relaxed enough for us to close the front door! Piggily "Wilbur" Wiggily's greedy appetite gave him his name, and his wiggly desire to be petted provided the whole litter with a surname. Euclid was a beautiful green-eyed silver tabby with wonderful geometric markings; he became very elegant as he matured. Piggily resembled his mother in his stocky build and long hair; he was fluffy white with large black patches, and able to keep surprisingly clean, although as a kitten his whiskers always had food on them. He loved to be vacuumed, liked to cool off by lying down in shallow water, and was quite friendly with my roommate's pet rat (he liked to sleep on the top of the heavy duty wire mesh cage). About a year later, we moved across town, bringing the Dodds and the remaining two Wiggilys with us. While we once trapped Mama Dodd for a trip to the vet, she had not become a real house cat yet, and was nowhere to be found on moving day. We were able to go back and find her however, and she adapted quite well, as you can see from the picture! All the Dodd-Wiggilys enjoyed their new home, with its grassy protected back yard. Unfortunately we were soon forced to move again, to less attractive house and neighborhood, and that where things started to go wrong. It seems now that the Wiggilys were just ill-fated, while MaDodd and the younger Dodds, with their less propitious beginnings, actually had longer better lives. Euclid did not last much past our move to this wilder area, he was too much the roamer and wanderer. For the first two days, confined to the house, he was miserable. Let loose, he disappeared for a week, showed up for a meal, then disappeared forever. We tried hard to believe that he was taken and cared for in a better home. Piggily was a happy part of the household for another year or so, but then he too disappeared for a week. When he returned, he was wounded, dehydrated and miserable. His tail was damaged, and he was changed beyond recovery. While he improved physically, he was severely traumatized. He was terrified of sudden movement and strangers, and took to living under the house, his long fur matted and dirty. The younger Dodds were in much better shape when I parted with my two house mates and moved away, but they did not live long lives. Mama Dodd-Wiggily did well for a few remaining years. We don't know her full history, but she certainly lived pretty rough for a while. Health problems caught up with her after a few years of comfort, and the vet could not help her. She had become very friendly with the few people she trusted, and even became something of a lap cat! Notes: Huppy Dod appears in the George Booth cartoon “Ip Gissa Gul”, New Yorker January 20, 1975, Huppy Dodd, our cat, was a bit dog like in appearance and behavior: he was cheerful, liked to follow us around, and his stiffly cocked half-length tail was not very feline! Huppy Dodd is not in the photo above, but was in the room (probably under my feet)! Mama Dodd-Wiggily sits in the foreground, with Rabbit Dodd and Euclid Wiggily to her right. As you can seem MaDodd is well groomed and healthy, she let us comb her and was quite settled in. Fluffy black tailed Piggily Wiggily is interacting with the caretaker of the crowd: Wheatgerm. Calpurnia sits against the cabinets looking upward. Wheatgerm and Calpurnia are not blood relatives to the Dodd-Wiggily family (as far as we know), but Wheatgerm came to Huppy Dodd's rescue on more than one occasion.